And it has, standing the test of time firmly in its dirt-plagued boots only to keep launching kicks up the jaded behinds of generations to come – creating band names in the process. A lot of Hard Rock acts truly take the aforementioned sentiment to heart. They embrace this heavy jazz of modern beatniks and take to the road wearing nothing but their sweat and stuffing their suitcases with sole instrumental necessities – for that is the sound of Rock. And they keep it alive by living for it, carrying on its legacy into the new age. However, whilst their devotion to tradition is always commendable, some may find their road already over-travelled and thus their trips are often seen as unnecessary ramblings of uninspired troubadours. 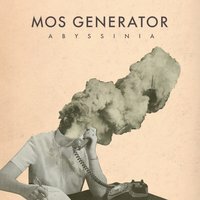 And MOS GENERATOR’s latest journey “Abyssinia” does indeed bare all the fine milestones of that familiar road, and therefore it unfortunately also makes you skip the odd checkpoint along the way. As soon as “Strangest Times” rears its opening chords you can instantly recognise that all-too-familiar sound of crunchy notes leaping from a dirty Les Paul fretboard through a dusty amp. It is that southern Hard Stoner Rock swing that makes everyone gather around the club stage with a red plastic cup; of course, whether they remain there is another question. …until you come to realise that it is all just too plain for your taste. Yes, “Abyssinia” is a consistent record, but it is also a flat one. Upon pressing play you rarely notice that you’ve actually gotten beyond the first song for it all sounds all too bland and similar. Nothing truly sets it apart from the average Friday night quarter at the local watering hole. And while they are very apt and know they way around a Rock song, the ones found on this record are quite tedious. Having said that, the band is good – particularly the drumming of Jon Garrett, whose use of toms and fuelled exploration of the kit is indeed laudable. Vocalist Tony Reed should also receive a mention for his strong and committed Chris Cornell inspired wailing. The production on the hand is rather polarizing. On the one hand, the raw, dry, possibly tape-recorded sound does contribute to the band’s organic quality and gives the listener an experience of being in the room with the band as they perform. However, the lack of quality in the production also adds the previously noted ‘flat’ sound of the entire recording. Overall – it is a Rock record; it’s fuzzy, grimy and packs an obligatory old-fashioned zest of the genre. And yet, even though it maintains the right attitude, you always feel like you could be somewhere else, listening to something with a better kick.